An evening cooking with friends, can be very healing experience. It reminded me of what is good, beneficial, important, beautiful, desirable and honest. Friendship is more than a simple passing association. Friends are those whose stories we know and want to hear them again. ” Without our stories, how will we know it’s us? Those who follow my blog know about my newly acquired skill, the Thai cooking. The pictures of the dishes I learned to cook and posted on the blog must have looked good because group of friends and colleagues invited me to be the chef of the evening on Friday night. One of them even volunteered to be my sous chef and do most of the shopping; although all the exotic ingredients were left for me to buy. 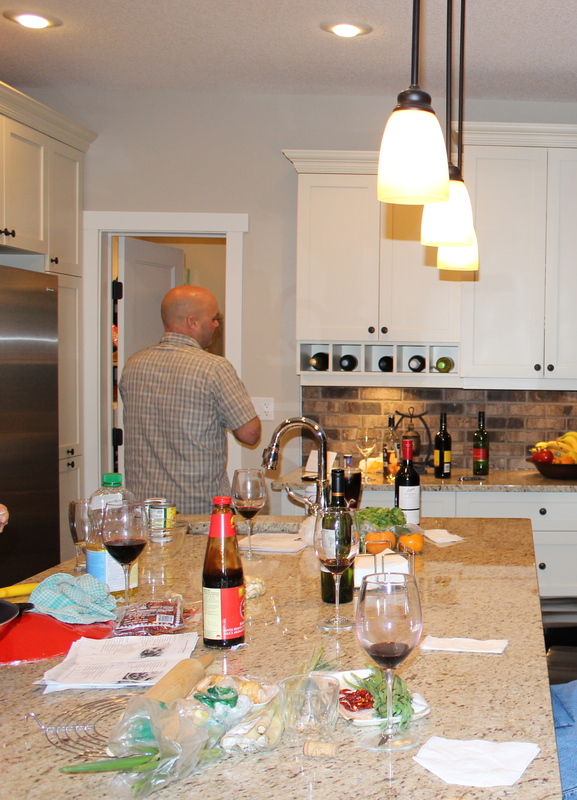 The event took place in a beautiful, newly built house with a deluxe kitchen. I immediately felt at home and knew I was going to have fun cooking. Hearth has an important evolutionary function in human history, so it did not surprise me when T decided to demonstrate or show off some of the special feature in the Kitchen. It is after all the most important part of the house. I went over to the house around four o’clock, unloaded the shopping, helped by my friends older son J, age 10. Inside I was greeted by the younger son age 7 and visitors of the host, who left after about an hour later. In that time J and I became fast friends. He was polite and very respectful. He was very curious as I took out the exotic ingredients and smelled them one by one; he could see the delight on my face as I sniffed and delighted with each one of the ingredient. The smell brought back the joyful recent memories of Thailand and its friendly people. Playfully, I invited J to check the exotic goods too. We had great time smelling the Kaffir lime leaves, chinese chives, galangal, coriander and lemongrass. Later we smelled the fish and oyster sauce, but he and his mother weren’t impressed with the smell of the oyster sauce. J and discovered we both love Greek Mythology . We talked about our favourite heroes and why we liked them. His mother later told me that he is not always this engaged with adults, it must mean he is enjoying himself. I was pleased to hear that because the smell and memory is closely related, so in the future when J came across the smell of each of the ingredient he may well remember our playful afternoon for the rest of his life. We started the preparation, the final cooking which was going to be done just before all the guests arrived. 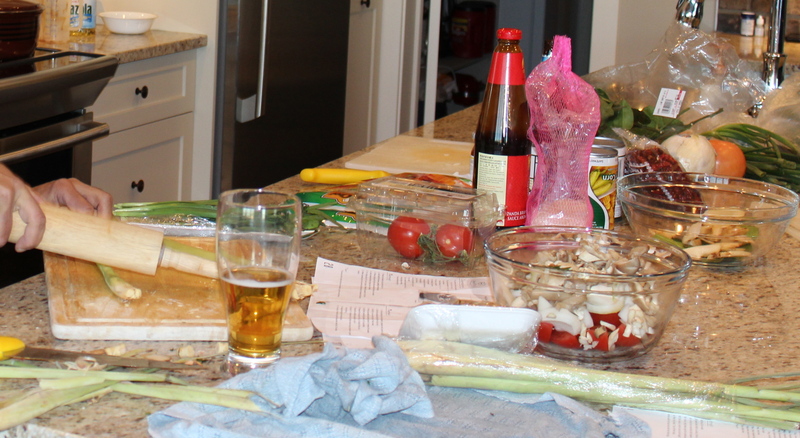 The sous chef was put to work , first she got me a beer, then she chopped, pealed , mixed, washed and stored. While J and I rolled the spring rolls. By the time rest of the guest arrived we were all hungry. We decided to cook and then eat one dish at a time. 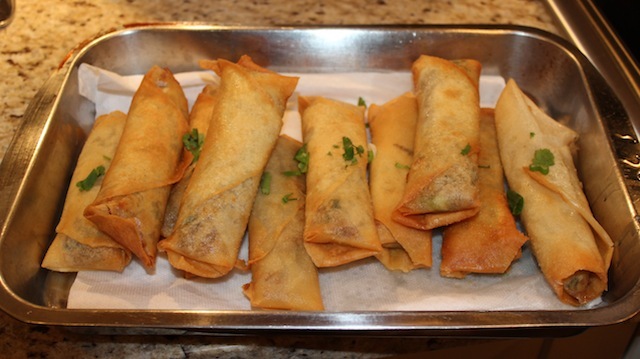 We fried the spring rolls first , they were delicious; some of us didn’t even let them cool down before we munched on them…they were good. After some wine we cooked the second dish, hot and sour soup. It too was a success but some found it little too hot. So more alcohol and ice-cold water was consumed to cool the palate. By this time we was beginning to get full. We continued with our banter and as we got more comfortable with each other the humour became at the expense of everyone taking part. We laughed with each other and not at each other. New friendship bonds were taking place and it was nice to be part of the process. It was getting late, everyone were full, but the main dish was still to be cooked. We didn’t want to waste any food so we decided to cook it anyway. The final dish, fried cashew nuts with chicken, was toned down by removing some of the red chillies since the hot and sour soup was too hot for everyone except me. It turned out to be little bland, so on hindsight we should have kept the chillies in after all. With all the fun and mirth we forgot to make the rice to go with the main dish. The advantage of forgetting to cook the rice meant there was just a little room for desert left. 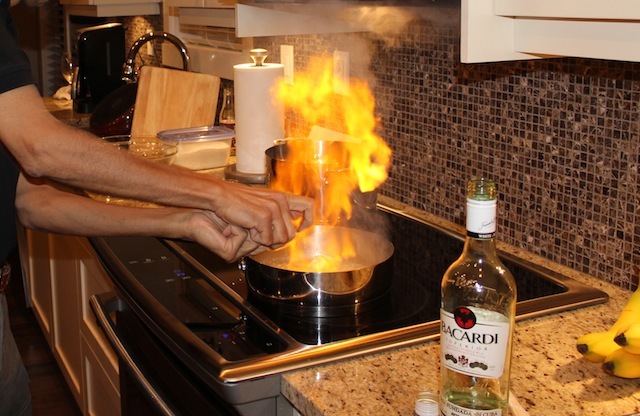 For the final finale I showed off my cooking skills by making a banana flambé . Everyone, including me, was impressed with the flame. The fire alarm went off as everyone giggle trying to turn it off. We rounded off the evening with watching D’s trip to Galapagos Island. At midnight even ten year old J was up. It was a fun-filled time , had by everyone. Five Guideposts To Illuminate The Spiritual Side Of Sexuality. Thank you for your feed back. Its good you find it helpful. That was a lot of fun! I really enjoyed it too. I am enjoying your blog, Dr. Chana, armchair traveller that I often am I usually read travel books. The blog is more diverse and interesting because I know who you are. Thanks. 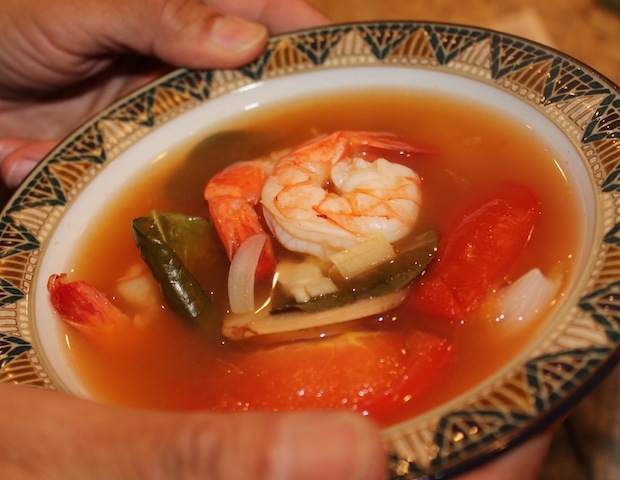 I enjoy cooking new things as well, many of the ingredients in the Thai food are new to me though, I will have to investigate! This will give me excuse to travel more! Thank you.